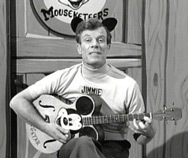 pair of Mouseketeer ears on the anniversary of the Mickey Mouse Club. the show will have a regular but ever-changing cast of preteens). 1955.) Today is Fun With Music Day. Giles), is born in London, England. since Disneyland's opening in 1955. The Emperor's New Groove, is born in Springfield, Massachusetts. for countless commercials and movie trailers. His most noted film appearance was Friday the 13th - Part 3. The Disneyland television series airs part 1 of the 1953 "Rob Roy." legendary real-life marshal-lawyer who lived during the mid-1800s. the dog! He was also the original Bozo the Clown - a part he played for 10 years starting in 1946.
vessels (attached to rails above) and "soar" over the skies of London. industrial robot arms performing stunts. The World of Disney (the world's largest Disney store) opens at Walt Disney World's Village Marketplace in Florida. Epcot's new IllumiNations 25 officially debuts to the public (although it has been entertaining guests since September). The Flying Fish Café opens at the Boardwalk Resort at Walt Disney World. Walt Disney Records releases Mouse House: Disney's Dance Mixes. by NASA, blasts off at Disney World. Disneyland's Davy Crockett's Explorer Canoes unexpectedly closes. Epcot's Discovery Center closes. Located in Innoventions East, it helped guests explore the subjects of Future World and World Showcase in more depth. The area occupied by the center will later become Mouse Gear (the largest retail store in any theme park). Disney Channel Italia (or Disney Channel Italy) officially begins broadcasting in Italian on Telepiù (an Italian digital satellite television platform). ABC-TV premieres the seventeenth episode of Disney's Recess, "Gus's Last Stand/Operation Field Trip." home video as is Disney's 1949 The Adventures of Ichabod and Mr. Toad. the new home of ABC, is dedicated. his vision of the holidays to life. and Kimberly Williams-Paisley & Larry Joe Campbell as her sister and brother. Colebourn will leave Winnie with the London Zoo. Edition Soundtrack and Disney's Karaoke Series: The Little Mermaid. The Little Mermaid 2-Disc Platinum Edition DVD. title cards being used to show the passage of time. Erwin Lawson in many of the Recess television episodes and video releases. Walt Disney Pictures releases the comedy Beverly Hills Chihuahua. Pictures and starring Diane Lane as Secretariat's owner, Penny Chenery, the film will open October 8.
who gives milk like a gas pump! welcomes the feline into his home. released. Mickey is late for a date with Minnie and has to get himself ready in a hurry with Pluto's help. of "Bibbidi-Bobbidi-Boo" (also from Cinderella), later reaching #14 on the Billboard chart. The fortieth episode of Disney's Recess, "Prickly is Leaving/Randall's Friends"
using Sung Dynasty landscapes which was instantly loved by Disney, and his artistry revolutionized animation. Today much of his artwork is on display at Walt Disney Family Museum in the Presidio of San Francisco. where guests come dressed up in their favorite dapper attire. Spin and Marty serial (which aired as part of Mickey Mouse Club). Kansas performs live at Disney World's Pleasure Island. A. Murphy Jr., the namesake of Murphy's Law, which states that anything that can go wrong will go wrong. ​Singer-songwriter "Weird Al" Yankovic supplies the voice of Milo. The new animated series Star Wars Rebels (produced by Lucasfilm Animation) premieres as a one-hour television film titled Spark of Rebellion on Disney Channel. The series itself will debut on October 13 on Disney XD.